The Cadbury Easter Egg A long-time favorite, this milk-chocolate egg filled with white and yellow-tinted fondant resembles a real egg when you bite into it – a favorite of children and adults, it can be found in drug stores, supermarkets and many shopping centers. Lindt Bunnies The gold-foil wrapped Easter Bunny from Lindt is now available at Target, as well as many supermarkets and drug stores. The Lindt Bunny, not to be confused with Dust Bunnies which hide under the bed and curtains, is available in dark, milk, and white chocolates. 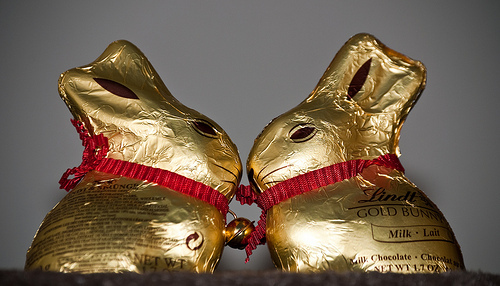 The Lindt collection also includes adorable foil wrapped chicks, bugs, bees and frogs – all of them delicious. Godiva Beaded Easter Egg This good egg may be hard to find, but there is likely to be a Godiva shop or collection near you and if you’re lucky, you’ll find this keepsake beaded egg containing twelve smaller foil-wrapped Godiva eggs. Theo’s New Chocolate Bunny Rabbit Another one you may not find easily outside of Seattle, but Theo’s Chocolate Factory now offers a 9 oz. dark or milk chocolate Easter Bunny made from Organic Free Trade chocolate. They also offer chocolate covered marshmallow bunnies and hazelnut chocolate eggs that taste so good you’ll cry when they’re gone. Vosges Bacon and Eggs From the makers of chocolate covered bacon (hey, don’t knock it till you’ve tried it, it really is a wonderful flavor combination) comes a soft bacon caramel covered in a 55% milk chocolate. No longer available on their website, but may well be waiting at your nearest high end grocers. Vosges Exotic Bunnies Another superior chocolate from Vosges is the Barcelona Bunny – a long-eared little bunny filled with hickory smoked almonds and grey sea salt in a 45% milk chocolate coating. Or perhaps you’d prefer the Toffee Bunny, a butter toffee with pink Himalayan sea salt enrobed in a dark milk chocolate. Christopher Elbow Easter Egg Collection Finally, there’s the incomparable Christopher Elbow Easter Egg collection. Nine exquisitely hand-painted chocolate eggs filled with Christopher Elbow’s signature ganaches – including lavender caramel, passion fruit, and fleur de sel caramel. It is probably too late to order these on-line, but if there is a high end chocolate shop or department store near you that carries Christopher Elbow, pass on the jelly beans and go straight to these luscious gems.